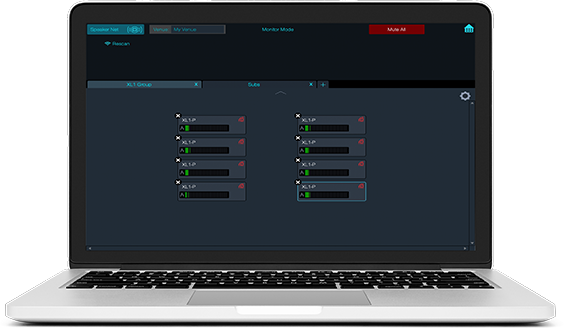 Comprehensive remote monitoring and control software for PreSonus CDL-Series Loudspeakers and WorxAudio PDA-Series Amplifiers. 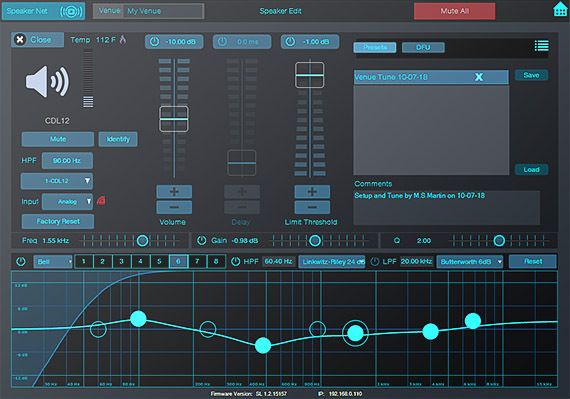 PreSonus Worx Control software makes tuning your system, creating groups and setting levels easier than ever. Optimize equalization, dynamics, HPF/LPF, and delay… while continuously monitoring clip detection and amp temperature in real time. Easy to set up and intuitive to operate, Worx Control is designed to seamlessly integrate with PreSonus CDL-series loudspeakers and WorxAudio PDA-series amplifier systems. It works with any local area network using standard IT routers and switches. No rack mount speaker management needed. Worx Control puts you in command of a suite of advanced DSP editing controls to customize your CDL or PDA-series system. Compensate for room anomalies, adjust delay, eliminate feedback, and more. Since you can use it from anywhere that you can access the network, you don’t have to ride a lift up to a flown system or burrow in an equipment room rack. Add a wireless router to your network and you can move around the venue with your laptop as you judge array coverage and sound quality from different seats. Learn more about Worx Control loudspeaker processing. The power that was once confined to costly external processors is now at your fingertips on a laptop. Up to 800 ms alignment delay in 0.1 ms increments is available to perfectly time-align your loudspeaker system. An ∞:1 limiter with -28 dB to 0 dB threshold controls dynamics without a mixer or outboard processor. 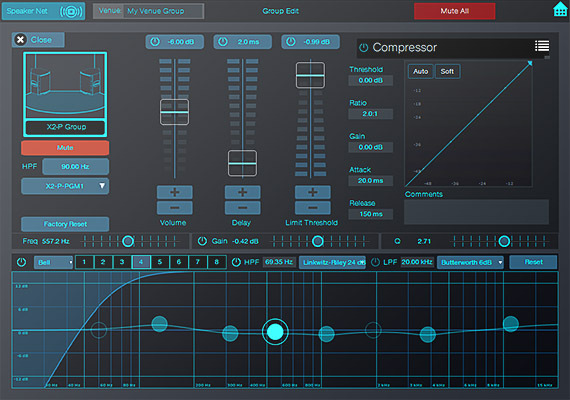 A sophisticated compressor has a –56 dB to 0 dB Threshold range. Attack is variable from 0.2 to 150 ms; Release from 2.5 to 900 ms; Ratio can be set from 1:1 to 14:1, and you can add up to 28 dB Make-up Gain. An extremely versatile eight-band parametric EQ allows you to compensate for room anomalies: you can configure each band independently to function as a bell, notch, All Pass, Low Shelf, High Shelf, High Pass, or Low Pass filter . Separate High Pass and Low Pass filters let you select Butterworth (6, 12, 18, or 24 dB slopes), Bessel (6, 12, 18, or 24 dB slopes), or Linkwitz-Riley (12 or 24 dB slopes). Remotely control the CDL18 or WorxAudio active subwoofer polarity invert to create subwoofer arrays or improve the system’s directivity. Adjust the input level of each loudspeaker to create a perfectly matched system. Simplify system tuning and troubleshooting with Mute and Solo controls. Easily manage speakers as groups. Your speaker system’s sound quality is the sum of its parts. Worx Control helps you get those parts playing well together. 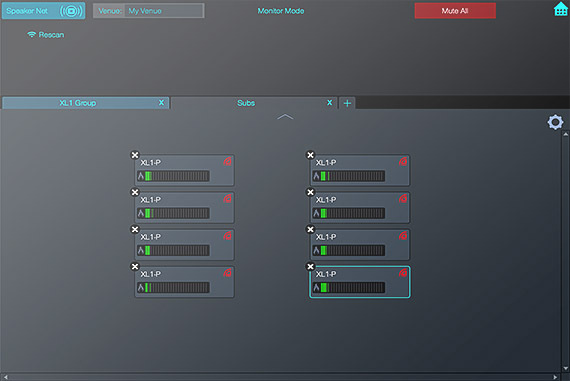 More than just providing extensive control and performance monitoring for individual speakers, it also lets you group speakers in order to manage specific parts of the system, then save all settings for the entire system in a single preset. That means you can control the entire system at once from a single laptop or tablet. Learn more about managing speaker groups with Worx Control. Combining CDL or WorxAudio speakers, subwoofers and floor monitors into groups allows you manage and customize each section of your system. In Worx Control, you first create a “Venue” for all the speakers on the network. Then, within that Venue you have the ability to create “Groups” of speakers. Presets can be saved for groups, individual speakers, or both. These are recalled when the same venue is re-opened or loaded on a group or on an individual basis in other venues that have the same model of loudspeaker. It’s as easy as dragging and dropping icons on screen. For instance, you can create named groups for front-of-house, satellite speakers, stage monitors, balconies, and more and see a visual representation of the group. Then you can manage the level of each group while maintaining the relative level of individual speakers within the group. Want to mute your floor monitors during a break? Create a Floor Monitor group and mute the entire group at once. Need to send your main mix to the church or theater “cry room” but still maintain independent level control? Easily create a Cry Room group and set the level on your laptop! A custom map is created after any loudspeaker is added to a speaker group. Each loudspeaker’s settings are stored in its position within the speaker group map along with any subsequent changes. If a loudspeaker is not detected on the network, its mapped position is still saved with the Group so you can use a different loudspeaker to fill its position without reprogramming anything. Just drag-and-drop the replacement into the stored position on the map. Preserve your settings—even when you’re not connected. With Worx Control, you can edit, save, recall, and share speaker-setup parameters, as well as set custom labels and comments for each speaker. Save complete snapshots of every speaker setting; then copy-and-paste speaker settings quickly and easily between loudspeakers. Every setting is immediately stored, so you can configure your loudspeaker system with Worx Control and then disconnect the application without changing the sound you’ve created. Complete wireless control and performance monitoring. An outboard speaker processor can’t monitor your loudspeakers’ amplifier performance. Worx Control keeps your stress level low by monitoring key performance indicators in real time for each speaker on the network. It can identify thermal problems and signal levels that are too hot (ADC clipping), each with a bright, blinking on-screen indicator, so you can correct problems before things go terribly wrong.